Want to whip Windows Vista or Windows 7 into shape and tweak your OS six ways to Sunday? Then you'll want WinBubble (free), which is a tweaker's dream. It lets you change just about every part of Windows Vista and Windows 7, and ways you never thought possible. 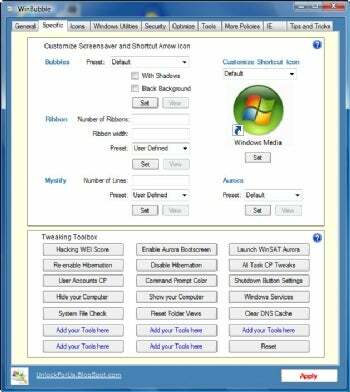 WinBubble may look cluttered, but it lets you tweak Windows Vista and Windows 7 in just about every way you can imagine. Whether you're looking for optimization tweaks, interface tweaks, desktop customization tweaks, security tweaks, or Internet Explorer tweaks, you'll find that and more. Want to change the way Desktop and Internet Explorer look and work? Customize all your icons? Remove the shortcut arrow from shortcut icons? Yes, you can do that--and plenty more. And WinBubble doesn't just give you access to hidden menus. It also lets you customize things that seem to be uncustomizable, such as the Bubbles, Ribbons, and Mystify screensavers. WinBubbles interface and layout isn't the prettiest, but that doesn't really matter. What matters is how much you can tweak, and how easily to do it. New to this version is the ability to customize your Windows Welcome screen wallpaper, adding icons to the right-click menu in Windows 7, a simpler method of password recovery, and other similarly useful tweaks.